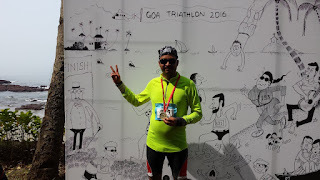 It was during the Goa river marathon in Dec-15, that I first heard about Goa triathlon which has the swim in sea. The idea of sea swimming suddenly seemed very thrilling as how else do I get ‘my feet wet’ otherwise? I knew an organised event will have all safety measures and best way for me to get initiated into sea swimming. 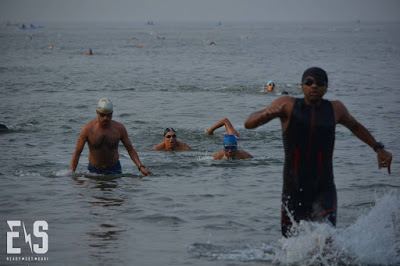 To be fair, I have had experience of triathlon during Manas triathlon in Pune in Apr-2014, But swimming in open water body as a lake and sea is drastically different, esp. for a person not having regular access to sea. The only thing holding me back was whether this weekend will be free in the makeover competition I was attending. As soon as I got to know that this weekend is free, I registered. Me and Mihir deciding to GOa for it. For the uninitiated, Triathlon has multiple variants in increasing order of distances for the three legs of swim, bike and run. 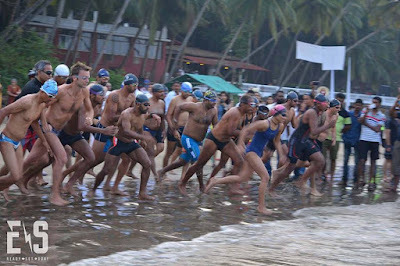 Triathlons are conducted in categories of super sprint, sprint, Olympic, half ironman, 3/4 ironman and full ironman. This time, I was going to attempt the Olympic size which means 1.5 Km. 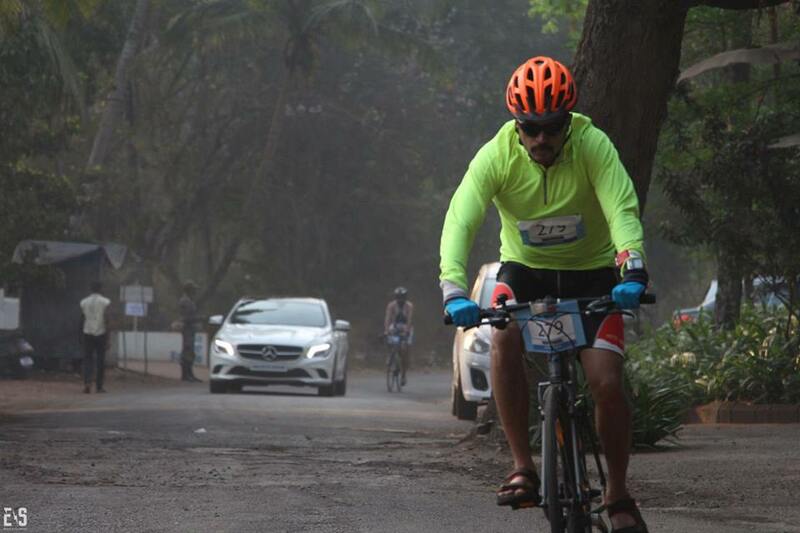 of swim, 40Kms of bike, and 10 kms of running in that order. Since the cycling leg is usually the longest followed by the running leg and then by swimming, it is recommended to use freestyle stroke. That is not only faster but primarily is upper body driven leaving the legs fresh for cycling and running afterwards. Triathlon is a pretty complicated sport from planning and execution of the transitions. The T1 transition is your swim to bike transition with needing to wear cycling shorts, jersey, gloves, helmet and footwear after taking of your swim gear. Generally, you run in the same cycling shorts and jersey and footwear, so the T2 transition is usually quicker. The preparation: I had done decent amount of strength training, cycling and running including combination by ‘brick’ workouts. 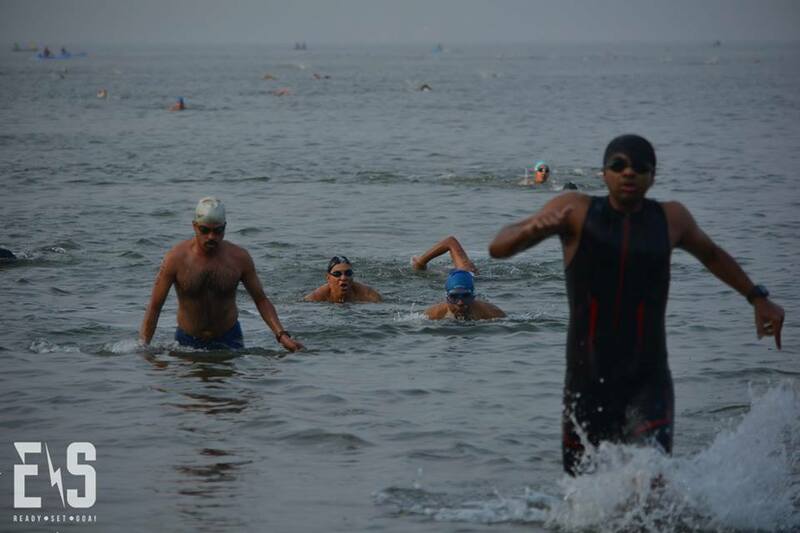 Mainly, The fear and the excitement of getting to swim 1.5 Kms in the sea was overriding. To add to that, I could not find anyone who had actually done sea swimming to advise me. I did get lot of help, with the best intention of course, from friends into fitness activities and with some open swim knowledge as well as the net. With a month to go, I decided to ensure I correct my freestyle though I was a decent swimmer and knew both freestyle and breaststroke. I have never really learnt this stroke from any coach but picked it up on my own during college days. I signed up for freestyle swimming coaching from Rajesh Kelkar Sir at Chaitanya, a person I admire a lot. It indeed turned out to be an awesomely wise decision, Nothing like a coach to correct and guide. 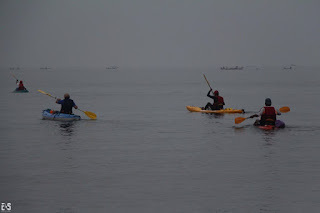 It was January when I had signed up and pretty cold, so most of the times I was the only student. The advantage being undivided attention, and the fact that I could not wriggle out of any tough drills. My freestyle had inefficiencies which Rajesh sir worked on in the first 2-3 weeks of stroke correction. He realized my hands cross and my legs don’t break the surface once I am a bit tired. Also a basic issue was I am not doing the breathing pattern of deep breath in through the mouth, hold, get in a few power strokes and then exhale fully before coming up for breath. 20m X 2, 20m X 4 Drills of only legs kicking, only arm pull followed by normal swim were practiced till I was able to do around 700-800 m comfortably. I realised it was a pretty fast upgrade to a level where my freestyle resembles a practiced stroke. In the last week, he was pushing me to do at least 1.5 Kms distance in swimming pool in last week. I was persistent on getting my stroke corrected, as that will increase my efficiency. I was not worried about my endurance per se, knowing I can do 1.5 Kms distance in the actual race. Really a battle in my mind due to this difference of strategies. Ultimately I had no option but to stick with my guts as there was no time. To Rajesh Kelkar Sir’s credit. He let me have my way. That said, In the last 3-4 days to go, I kept on having repeated nightmares that I am swimming and just not reaching anywhere. With only one prior real open water swim experience, I had to pull off one of the biggest leaps of faith for me. I guess butterflies in the stomach are to be expected. The journey to Goa: As usual going to Goa is always something which enthuses me. Me and Mihir planned our packing list. Having prior experience for a triathlon packing did help a lot and it was pretty quick once we got to it. We dismantled the front wheels of the bikes and loaded into the boot. Once the middle and last rows seating of the innova are folded, it is comfy for two to three bikes with only 2 passengers. Loaded the car the day before to get a quick and early start, and by five thirty am we were on the road. The onward journey was pretty uneventful, two stops; one ahead of Satara and one at Belgaum. A quick change of drivers and passing through the picturesque Chorla ghat, Me and Mihir reached Panjim by lunch time on Saturday. I was happy to manage to meet the Ananta Ashram lunch time deadline, have never been able to go there for lunch though have heard so much about it. Had a good hearty family style meal and then we went to collect our bibs at Bambolim beach resort. Registration: A triathlon typically has less registrations, so it was a pretty painless process with hardly anyone asking for any ID proof. The enthusiastic volunteers at Goa really helps your morale. Got to see lot of professional teams, with very good equipment and time trial and triathlon road bikes. 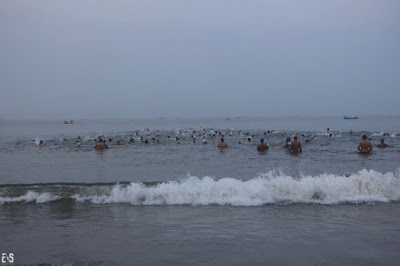 Here I was just coming casually to get sea swim experience and lot of people with intention to win. I realized I had got so much focused on the sea swim that I did not pay proper attention to cycling practice against these beautiful speed machines. We did a recce of the ‘complicated’ route. The cycling route was multiples of approx. 6 Kms loop and it seemed as it would be hot on the late morning as hardly any trees around. I had to do a decision on barefoot running or to get shoes as my transitions kit needs to be planned that way. Made the decision to go barefoot, so entire part for me was in T1 kit, packed two nutrition bars and sugar boiled confectionery in my waist pouch. I had wisely chosen a full sleeves dri-fit jersey rather than my regular cycling jersey so that it would be better in the expected hot sun when I start running. Assembled our bikes, put the bike bib on the handlebar and then submitted to the bike area to leave less effort on the morrow. I set my target as 3:30 hours for the entire triathlon distance. Race day ’21-Feb-2016’: Reached the registration desk in the early morning and no. of participants of almost 350 made it an awesome spectacle. 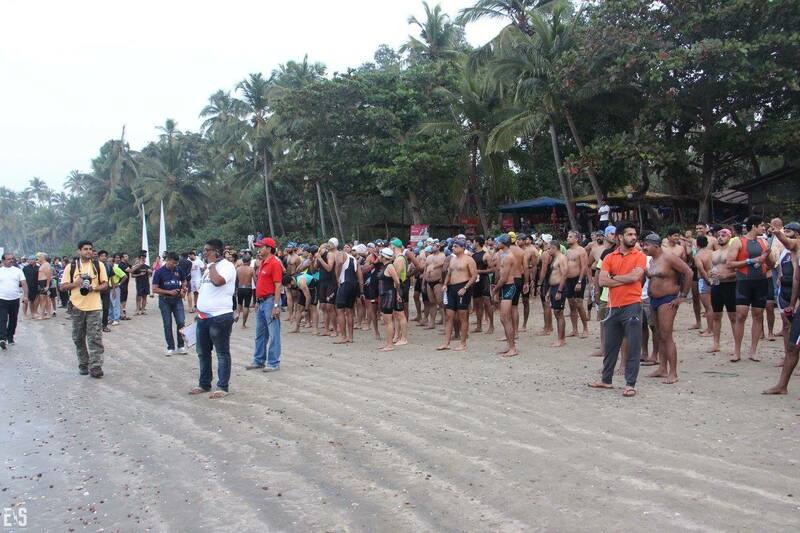 It was indeed an eager crowd of triathletes at the beach for the start. Ensured my googles are correctly set as sea water getting inside is an real issue for the eyes. Realised I am not able to recollect how to set triathlon mode on my Garmin GPS watch. 5 mins before the start, I got help from a person having the same watch. Nerves !! The Get, Set and GOA was a very apt starting call at the starting whistle. 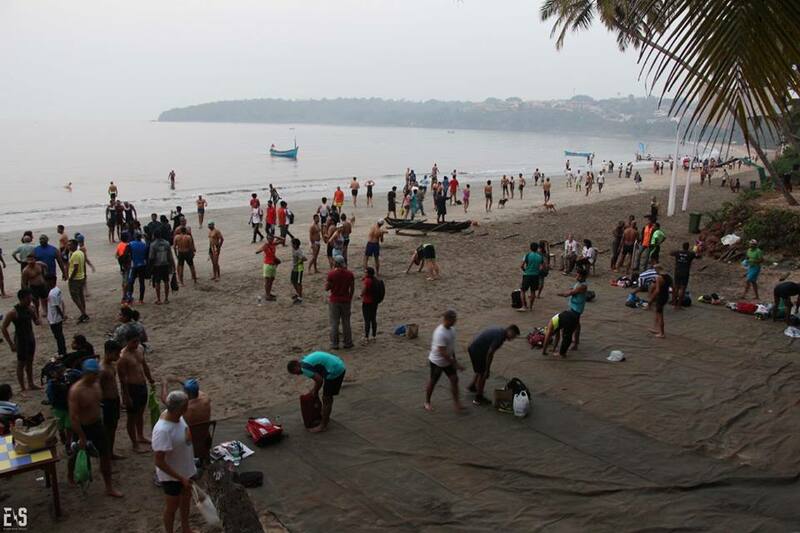 The swim route was 700m straight out from the beach to a boat to a flag marking the first turning point. After that swim 100m parallel to the beach and then take a left turn from the boat with a flag marking the second turning point and 700m back. At least that was the route in theory.As you can see from the photos, Mass start is a real challenge and the first 200m was practically also a battle to avoid wading into anyone. Did get 1-2 kicks but luckily could duck and bore the kicks on my shoulder. Transition T1 was organized pretty well actually with proper numbered cycle racks.Getting out of the swim kit and into the cycling kit was a pain, the jersey refused to slide on quickly. The bikes were at least 200m away and I lost almost 7 mins in transitioning. Climbed up the 1.5Kms ascent to the bike loops, realised that counting the loops and keeping track of the complicated transition points, A and B turnarounds was too much. I just relied on my Garmin distances. at the first loop I realized I had forgotten my waist pouch. That meant, I was getting hungry and except for the enerzal bottle on my bike, I had nothing with me. Murphy’s law !! I asked for biscuits from a friend’s wife who was there to support him and that sustenance was very helpful. Next time round, need to have some nutrition on the bike saddle pouch itself. During the last 2 loops on the cycle, I was beginning to get niggles in my knees and I slowed down just a bit, reducing my gears to 3×4 from 3×6. The sun was getting high and I was thankful for wearing my wrap around cycling goggles. T2 : Transition and on to run. 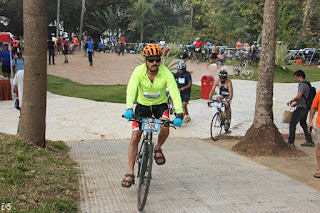 When my cycling was done, It was such a relief to be helped by a volunteer who took my bike and sandals and I could get rid of my helmet and gloves very quickly and start my run. Being almost 9:40 am, the sun was really high and hot. By this time, it was the zone and felt comfortable, then realised it was the UV goggles creating an cool impression, I was drinking water at every water station now. Having transitioned to a Barefoot runner was a good decision initially as was able to maintain a reasonable pace for a triathlon. However, km no. 7 to 9 on the tar road was blazing hot and I struggled through. The last KM was a descent into hell as the road was narrow, had a pretty sharp descent grade and the tar surface was really broken up. I took almost 30 mins for last three kms run, which of course meant my timing crossed 3:30 hours which initially looked comfortable to do below 3:20. It is definitely not over till it is over. My garmin watch told me that the running pace went from 5:30 mins/km at the start to almost 9:00 at the last km. 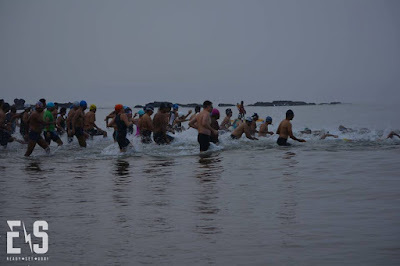 Looking ahead: The sea swim, humidity and heat are becoming somewhat less alien and that can only bode well for the future. 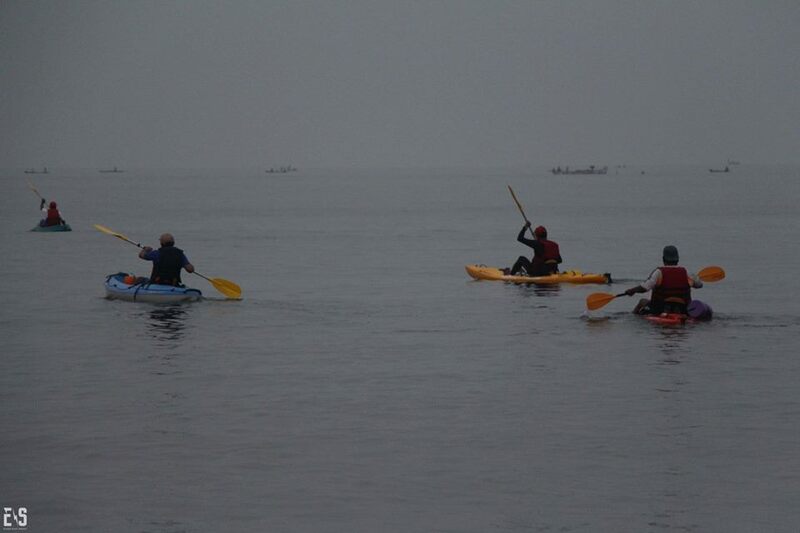 I am now eager for any sea swim triathlon, though of course this was at calmer seas. Looking forward to next triathlon hopefully with better and faster swim, road bike and good running technique to go below 3 hours. Looking at all the challenges though, super duper happy with final official time of 3:34:52! Never thought coming at 63rd position would make me happy, but that’s how it is sometimes you truly Tri Tri and you succeed by just completing a mental and physical challenge.